Before we get started this week, I wanted to give the highest possible recommendation to the outstanding new tome by Mike Stax (majordomo of the Ugly Things empire), ‘Swim Through the Darkness: My Search for Craig Smith and the Mystery of Maitreya Kali’. Covering the amazing story of Smith, from his time on the Andy Williams Show, to near-Hollywood stardom, the recordings of Chris & Craig, the Penny Arkade and then the ultra-rare Maitreya Kali recordings, Stax lays out a fascinating picture of mid-60s LA, touching on mainstream and underground showbiz. His detective work, filling in the blanks about Smith’s tragic missing years, is first rate. ‘Swim Through the Darkness’ is very well-written, and if you’re a fan of mid-60s Cali rock and pop there are revelations in every chapter. I haven’t been reading much lately, but I tore through this in a few days. I really have no idea why I haven’t posted this song before. 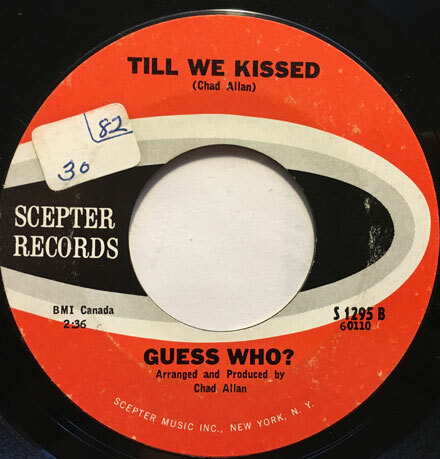 It is one of my favorite, non-UK beat records, and the flipside to one of the greatest proto-garage numbers ever to drift down from the Canadian hinterlands, that being ‘Shakin’ All Over’. The group is question is the early incarnation of the Guess Who, when they were still led by Chad Allan (who was later edged out by Burton Cummings who would lead the group through their best known hits). 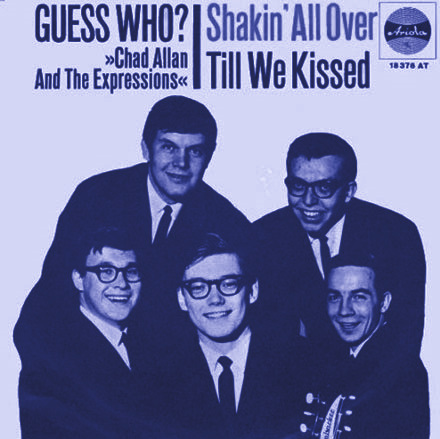 ‘Til We Kissed’, released by Chad Allan and the Expressions (and then pressed up as by Guess Who? in an attempt to sucker in Beatlemaniacs) was in fact a cover of a song written by Barry Mann and Cynthia Weill, and first recorded by Arthur Alexander (at a slower pace) in 1961. The song was then covered by a number of beat groups (including the Beatles in their live sets) like Gerry and the Pacemakers, the Searchers and Ray Columbus and the Invaders. The Guess Who take on the tune is beat perfection, and a prime example of the translation of R&B material into the beat group ‘language’. The guitars ring and pulse (there’s a lightly tremeloed rhythm guitar deep in the mix) and the piano solo (which sounds like it might be doubled by a guitar) is sweet. In one of the weirder coincidences, I remember a character on the old sitcom ‘Mad About You’ singing this song on an episode of the show. It’s one of my favorite songs, and having it on the flip of ‘Shakin’ makes for a tasty two sider, indeed. Here, in episode #54 we have a bunch of recent arrivals (including that Real Don Steele 45, one of my personal white whales) , a set of garage goodness, a bunch of groovy instrumentals from Sandy Nelson and some Buffalo Springfield covers, as well as the cream of the archives. NOTE: There were some problems with sound dropping out in this edition of the podcast. I reassembled the file from scratch and remixed it. The link above should work fine. If it doesn’t, please let me know. Welcome to this month’s episode (#45) of the Iron Leg Radio Show. Thanks completely to aforementioned health issues, this episode comes to you a little late, yet no less groovy. There are all kinds of goodies this time out, especially two sets of very interesting, little-heard early work by the vocalist Jennifer Warnes.